This week’s letter is C, and today’s author is Colette. 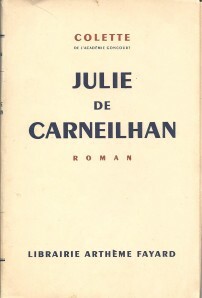 Julie de Carneilhan was published in 1941, reprinted by Penguin in the 1950s in an English translation by Patrick Leigh Fermor. Apparently it was filmed in 1950, and in 1990. Leigh Fermor’s translation is over 60 years old now, as timeless as the novel itself, but also not modern; there’s a certain datedness about the vocabulary which makes it classic. 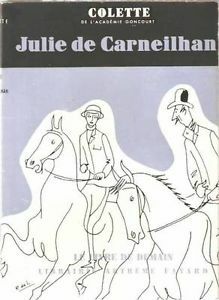 Julie de Carneilhan is a story of bleak survival in the demi-monde of prewar Paris, except for the last few pages when, suddenly, Julie walks away from the tangles and grubbinesses of her life, to climb onto a horse and ride off, out of Paris, away from the sunrise. She is brave in the face of indignity and poverty, a magnificent character. 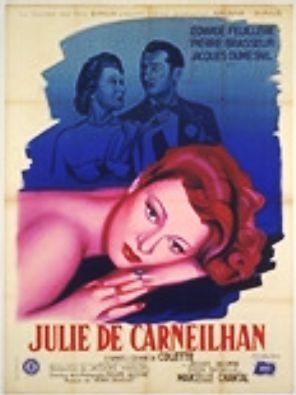 Julie de Carneilhan is a woman in her forties, from a very old noble Breton family. She lives in prewar Paris, a double divorcee surviving on a small allowance from her first husband. In the last week of each month, she begins to starve, waiting for the next cheque of her allowance to arrive. She is too proud to ask anyone for help. Her elder brother is as impoverished as she is, breeding horses on a shoestring, and struggling to find the money to feed them. Julie mends her clothes and furniture, and makes them last with clever stratagems, but she still employs a daily charwoman. She amuses herself by going out with younger people from lower social classes, but she is always aware of her own more noble lineage, as well as her greater experience in life. The feeling throughout this novel is of defiance against fate. She’s going downhill, slowly. She dresses elegantly to go to nightclubs and the cinema, but her resources are shrinking. Like all women of this period, she relies on men to take her out and pay for meals and drinks. She isn’t a prostitute, because her pride is too strong, but she allows her young admirer to take her to bed when she feels like it. The complication in Julie’s life that produces this story is that Julie’s most recently divorced husband, the Comte d’Espivant, has just had a heart attack. He asks Julie to come and see him, because he wants to use her to make some money from his current wife, whom he dislikes. Julie is thus conveyed to her former home by her former chauffeur, and walks through the rooms she had decorated during her marriage, not many years earlier. She spends a combative lunchtime with Espivant, during which he has another heart attack, which she brings him through. There is affection between them, but also aggressiveness brought on by his masculine assumption that he still has a claim on her, and her anger at his infidelities. They both despise his second wife, Marianne, Julie’s successor, who is an extremely rich widow, but who is not noble, unlike Julie and Espivant. Aristocratic snobbery fuels their pride, and Colette describes this so persuasively that it seems quite reasonable to accept that the lower classes, rich or not, are as nothing in the French understanding of blood and birth. Despite the clearly historical setting, this is a modern novel of manners and strategies to survive daily life. We warm to Julie because she is poor and prefers to uphold her sense of good taste rather than make money by ignoble behaviour. We applaud her feelings of superiority about the banality of her lover and her nightclub singer friends; and we rather wish that she and Espivant would get together again, and get rid of Marianne. However, this is not a love story. Julie does not care enough about Espivant to put any faith in his moneymaking scheme, even though she considers becoming his lover again. I love the atmosphere in this novel of fierce fighting against fate, the strength of Julie’s free will. She’s a very strong person, but she can change her mind on a whim, and suddenly be kind, or chilly, or frivolous, or depressed. I am fascinated by the historical detail of maintaining standards of living in a shabby but still respectable studio flat, where a lady can still be a lady even if she is desperately poor. Julie’s capability with her hands, and her housekeeperly knowledge of how to take the shine off the elbows on an old suit, and how to mend a broken chair leg, are not what we expect from a lady at all. Julie comes from a different kind of aristocracy to, say, the English aristocrats described in Nancy Mitford’s novels of the same period. Contrasting with this making do and mend, Julie saves money where she can, and spends freely when she feels like it. She is generous when she can’t afford it, because her generosity is an impulse. It’s cherished as an expression of her free will. 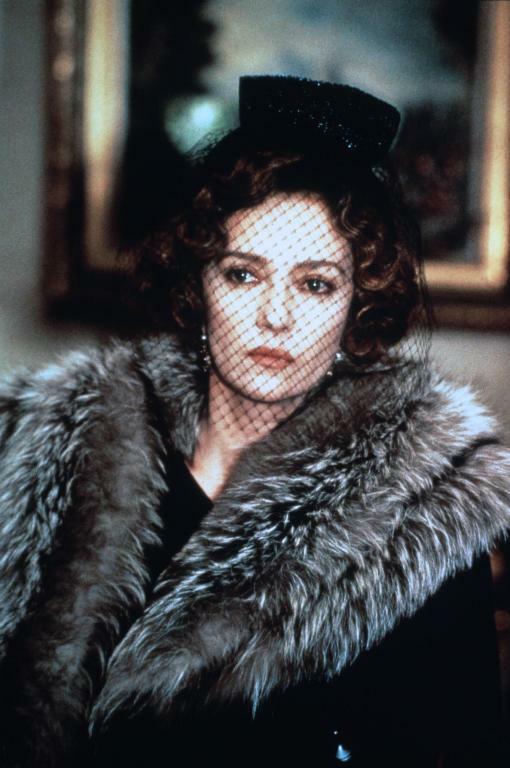 I am also fascinated by Julie’s decisions to allow herself to accept a lover from the trading classes, and to reject him when his bourgeois mind becomes too boring and distasteful. She despises poor Coco Vatard because he fusses over his father’s car, he worries about not getting an early night before a working day, because he talks so importantly about the factory that he runs. She doesn’t bother mentioning her brother to him, because Coco is not significant enough in her life to be told about her family. She won’t talk about what moves her deeply, because she will not share such intimacy with him. She despises Coco’s bourgeois aspirations, and refuses to be part of his domestic fantasies. In the end she refuses to continue this relationship with a man who is simply not up to her standards. She would prefer someone who didn’t care about scratches on a car or who could dance all night. If she can’t have that, she won’t make do with less. She’s picky, but for all the right reasons. Her disdain, and her easy efficiency in getting rid of the poor man, are magnificent. The main upset to Julie’s emotional equilibrium is Espivant, who is a devious manipulator. Julie cannot resist him, but she is too proud to fight back. He uses her shamelessly, like a hired negotiator, to get money from his wife. A spirited traditional heroine would throw the cash back in his face, despising his attitude, but Julie does not care enough about Espivant for that. She also needs the cash: her charlady must be paid, and so must the rent. Her debts are more important than her personal feelings. But he makes Julie vulnerable. We can see why she married him, and also why she left. Aristocratic pride is the theme of this novel. It makes Julie real, and makes her brother Léon real. They are both middle-aged with few prospects of getting any richer, but they refuse to abandon their family’s standards of behaviour for money. This is attractive behaviour because it is quixotic: it doesn’t look likely to lead to a happy ending, but they will reach their ending with their heads high. When Léon sells up, and moves his last three horses back to the collapsing family castle in Brittany, Julie abandons her rackety, pointless Paris life to go with him. Their rejection of Paris and a miserable life, is profoundly moving. It has the romance of a new beginning, and of making a last throw of the dice before inevitable poverty and death. 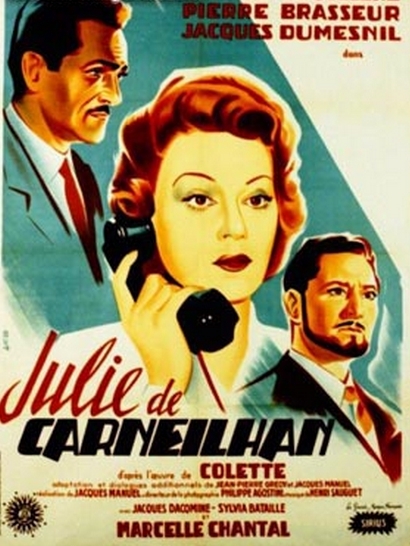 Julie is escaping the inward-looking circuit of Paris gossip which knows her entire marital history, and also her two humiliations by marriage. She leaves no-one of any importance behind, and we have no reason to think that anyone will care, except poor Coco Vatard and the little nightclub singer Lucie, who think that Julie is a miraculous dream of sophistication. The subtext to this novel is that war is about to descend on France. It was published around the time of the German occupation, and, if Léon, and Coco, had gone into the army as it is suggested that they will, they are unlikely to survive. But Julie might survive: she is tough enough, and knows how to endure poverty. That’s probably why I love this novel so much, because it’s about the importance of survival.